Mailing address: 104 Davey Lab. #208, Penn State University, University Park PA 16802, U.S.A. Commonly it has been supposed that the coding by neuronal firing for the various percepts recognized by a brain is in complex distributed patterns of firing. However, in recent years it has increasingly been found that there are also neurons that respond very simply, in a wide variety of organisms from birds to primates, both non-human and human. For example, there are neurons that fire exactly at one moment in the song of a zebra finch, and there are neurons that fire when a human sees an image of one particular person. We aim at understanding the algorithms in which these neurons participate, and to relate these to the properties of individual neurons. How do neurons create the complex sequences in birdsong? How are memories formed? How are they represented? Possible algorithms are highly constrained in order that large amounts of information can be processed and stored without running out of space. See my publications in the INSPIRE database for a fairly complete list of my publications in elementary particle physics. J. Collins, "New definition of TMD parton densities" in Proceedings of QCD Evolution workshop, Jefferson Laboratory, April 8--9, 2011, Int. J. Mod. Phys. Conf. Ser. 4, 85-96 (2011), arXiv:1107.4123. J. Collins, "Rapidity divergences and valid definitions of parton densities", in Proceedings of LIGHT CONE 2008 Relativistic Nuclear and Particle Physics July 7-11, 2008, Mulhouse, France, PoS LC2008:028,2008; arXiv:0808.2665. J.C. Collins and T.C. Rogers, "The Gluon Distribution Function and Factorization in Feynman Gauge", Phys. Rev. D77, 085009 (2008); arXiv:0805.1752. John Collins and Dezhe Z. Jin, "Grandmother cells and the storage capacity of the human brain", q-bio.NC/0603014. John Collins, Alejandro Perez, and Daniel Sudarsky, "Lorentz invariance Violation and its Role in Quantum Gravity Phenomenology", in Quantum Gravity, D. Oriti ed. (Cambridge University Press); hep-th/0603002. John C. Collins, Aneesh V. Manohar, and Mark B. Wise, "Renormalization of the Vector Current in QED", Phys. Rev. D 73, 105019 (2006); hep-th/0512187. J.C. Collins and A. Metz, "Universality of soft and collinear factors in hard-scattering factorization", Phys. Rev. Lett. 93, 252001 (2004); e-Print archive: hep-ph/0408249. J. Collins, A. Perez, D. Sudarsky, L. Urrutia, and H. Vucetich, "Lorentz invariance: an additional fine-tuning problem", Phys. Phys. Rev. Lett. 93, 191301 (2004); gr-qc/0403053. J.C. Collins and X. Zu, "Parton Distribution Functions suitable for Monte-Carlo event generators", JHEP 06 (2002) 018 e-Print archive: hep-ph/0204127. J.C. Collins, "Leading-twist Single-transverse-spin asymmetries: Drell-Yan and Deep-Inelastic Scattering", Phys. Lett. B536, 43 (2002); e-Print archive: hep-ph/0204004. J.C. Collins and Jon Pumplin, "Tests of goodness of fit to multiple data sets", e-print archive: hep-ph/0105207. J.C. Collins, "Monte-Carlo Event Generators at NLO", Phys. Rev. D 65, 094016 (2002); e-Print archive: hep-ph/0110113. 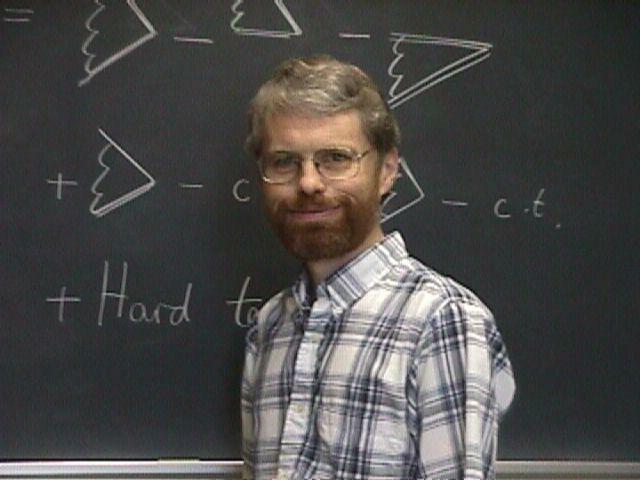 J.C. Collins, "Subtraction method for NLO corrections in Monte-Carlo event generators for leptoproduction'', JHEP 05 (2000) 004; e-Print archive: hep-ph/0001040. L. Alvero, J.C. Collins, J. Terron and J. Whitmore, "Diffractive Hadronic Production of Jets and Weak Bosons", Phys. Rev. D59, 074022 (1999); e-print archive: hep-ph/9805268. J.C. Collins, "Hard-scattering factorization with heavy quarks: A general treatment", Phys. Rev. D 58, 094002 (1998); e-print archive: hep-ph/9806259. J.C. Collins, L. Frankfurt and M. Strikman, "Factorization for hard exclusive electroproduction of mesons in QCD", Phys. Rev. D56, 2982 (1997); e-print archive: hep-ph/9611433. J.C. Collins, "The Problem of Scales: Renormalization and All That", in "Theoretical Advanced Study Institute in Elementary Particle Physics, 1995: QCD and Beyond", D.E. Soper, ed., (World Scientific Singapore); e-print archive: hep-ph/9510276. X. Artru and J.C. Collins, "Measuring transverse spin correlations by 4-particle correlations in e^+ e^- to 2 jets'', Z. Phys. C. 69, 277 (1996); e-print archive: hep-ph/9504220. J.C. Collins and D.E. Soper, "Issues in the Determination of Parton Distribution Functions", e-Print archive: hep-ph/9411214. Fall 2014: Methods of Theoretical Physics: Phys. 525. One of my pastimes is Scottish country dancing. For some of my musical activities, see also David Rosenbaum at 60 and Strath Hanna.